^ 2.0 2.1 M. Skyllas-Kazacos, M. Rychcik and R. Robins, in AU Patent 575247 (1986), to Unisearch Ltd.
^ Laurence Knight. Vanadium: The metal that may soon be powering your neighbourhood. BBC. 14 Jun 2014 [2 Mar 2015]. ^ Alotto, P.; Guarnieri, M.; Moro, F. Redox Flow Batteries for the storage of renewable energy: a review. Renewable & Sustainable Energy Reviews. 2014, 29: 325–335. doi:10.1016/j.rser.2013.08.001. ^ A. Pelligri and P. M. Spaziante, in GB Patent 2030349 (1978), to Oronzio de Nori Impianti Elettrochimici S.p.A.
^ UniEnergy Technologies Products[失效連結] Accessed 21 Jan 2016. 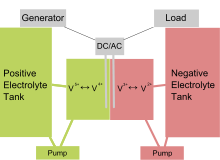 ^ Vanadium Redox Flow Batteries (PDF). Pacific Northwest National Laboratory. October 2012. ^ 10.0 10.1 Miller, Kelsey. 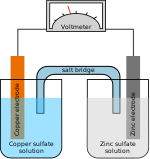 UniEnergy Technologies Goes from Molecules to Megawatts 互联网档案馆的存檔，存档日期31 January 2016., Clean Tech Alliance, 7 July 2014. Accessed 21 Jan 2016. ^ Stone, Mike. A Look at the Biggest Energy Storage Projects Built Around the World in the Last Year. 3 February 2016 [12 August 2017]. ^ DOE Global Energy Storage Database. www.energystorageexchange.org. [9 November 2017]. 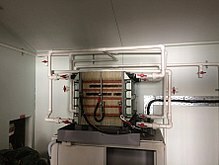 ^ Energy Storage in China. www.ees-magazine.com. [12 August 2017]. ^ 郑栅洁调研张北风光储输示范工程. http://www.nea.gov.cn/. 国家能源局. [2018-08-31]. ^ UET and Snohomish County PUD Dedicate the World's Largest Capacity Containerized Flow Battery. Energy Storage News. 29 March 2017 [29 December 2017]. ^ PUD invests $11.2 million in energy-storing units. Everett Herald. 2 November 2016 [29 December 2017]. ^ SDG&E and Sumitomo unveil largest vanadium redox flow battery in the US. Energy Storage News. 17 March 2017 [12 August 2017]. ^ Wesoff, Eric, St. John, Jeff. Largest Capacity Flow Battery in North America and EU is Online, Greentech Media, June 2015. Accessed 21 Jan 2016. ^ It’s Big and Long-Lived, and It Won’t Catch Fire: The Vanadium Redox-⁠Flow Battery. IEEE Spectrum: Technology, Engineering, and Science News. [12 November 2017] （英语）. （英文）The Need for Vanadium Redox Energy Storage in Wind Turbine Generators Net electricity generation from all forms of renewable energies in America increased by over 15% between 2005 and 2009.